10 -year-old American Quarter Horse gelding History:"Eeyore" was a champion western pleasure AQHA show horse. He was purchased for $35,000 by the original owner. When the original owner increased Eeyore's workload by starting to show trail; Eeyore started to develop lameness in the LF limb. The lameness was initially controlled with coffin joint injections. The coffin joint injections became more frequent and eventually became ineffective in relieving the lameness. Eeyore also developed a quarter crack near the lateral coronary band. The original owner became frustrated and sold Eeyore to my client for $12,500. Eeyore was grade 2 of 5 lame on the LF limb. He was negative to fetlock flexion, carpal flexion, hoof testers, and reverse wedge test. The quarter crack was dry and no longer painful. His lameness improved 50% after a LF palmar digital diagnostic nerve block. His lameness improved 100% after a LF basal sesamoid diagnostic nerve block. Because of the diagnostic nerve blocks we were certain that the lameness was coming from the foot, although we did not know which structures in the foot were injured. Radiographs of the LF foot showed neither osteoarthritic changes in the coffin joint nor any navicular changes. The radiographs did however show that bone structure within the LF foot was putting enormous amounts of stress on the navicular fulcrum and the front of the coffin joint capsule. Radiograph of the foot before shoeing prescription. Performance Horse Shoeing Measurements. Notice that the hoof angle is 47 degrees and the pastern axis is 66 degrees. Most pronounced is a -2 degree palmer digital angle. 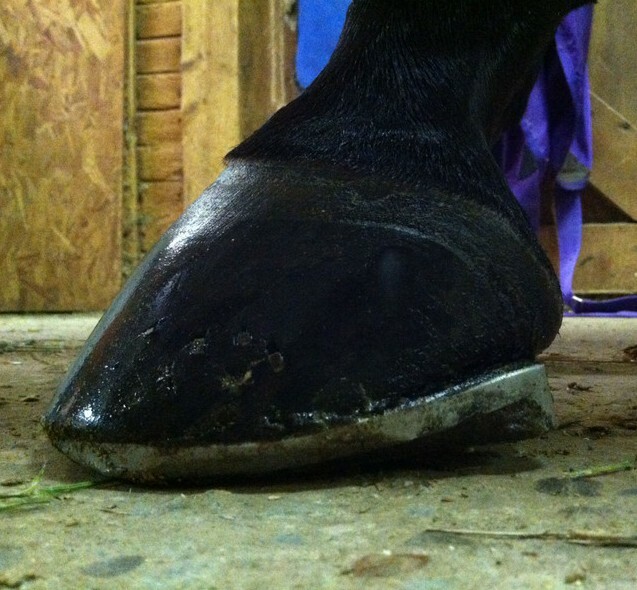 With the help of the farrier we increased Eeyore's palmar digital angle and hoof pastern axis by applying an "air wedge" or rockering the heel of the shoe. This helped decrease the stress on the navicular fulcrum. It also helps decrease loading on the quarters of the hoof. We brought the breakover back to 1 cm in front of the coffin bone and rolled the toe. This helped relieve stress on the front of the coffin joint capsule. I injected the front coffin joints with corticosteroids to decrease inflammation. 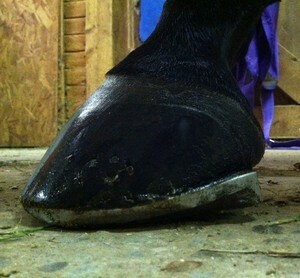 After Performance Horse Shoeing Changes: Notice the air wedge under the heel of the foot and the shorter breakover. We were able to increase his PD angle from -2 degrees to 5 degrees and nearly match the hoof angle to the pastern axis. The coffin joint injections performed by the previous veterinarian was able help relieve the pain from poor bone structure within the foot, however the inciting cause of the lameness was not addressed. Because the actual issue was never addressed the "cover up" procedure eventually stopped working. With performance horseshoeing we were able to identify and treat the actual problem. Eeyore has been sound for 2 years without joint injections. Eeyore's workload has increased dramatically in that time. Eeyore now competes as an all-around horse in western pleasure, trail, showmanship, horsemanship, hunter under saddle, and equitation. He has put on over 100 American Quarter Horse points in the last two years competing as an all-around horse without lameness.